After two weeks not touching the Mustang, I got a chance to get back to it last night. I had to add back some rivets that had been sanded away on the bottom of the radiator when I had to get rid of the uneven seam between the two fuselage halves, so I used my handy-dandy Trumpeter Rivet Making Tool. It's a nifty little piece of equipment for adding indented rivets to plastic. There are four interchangeable "wheels" for producing rivets, each with a different space between the rivets, so you can match any existing rivet pattern on any scale fairly closely. If you've been following me for any longer than the last two weeks, you know that I love a cheap DIY alternative to purchasing expensive modelling tools. Unfortunately, when it comes to indented rivet patterns, I haven't been able to come up with a viable alternative to this tool. Unless you want to sit there with a scalpel or needle and painstakingly punch in rivets one by one (and trying to keep the space between rivets equal), then you'll have to shell out some cash for one of these. Luckily it only cost me $11, so it's not going to break the bank. One thing I didn't mention in the video: if you don't have a steady hand, or if you have wonky eyes and can't run the tool in a straight line, you might want to draw on your intended line first with a fine mechanical pencil. 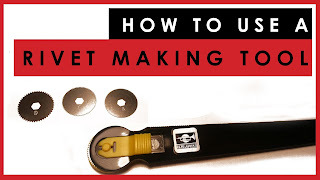 How to use a scale model rivet making tool.